As a kid, I was not a huge Batman fan. Sure I liked the TV show, but when it came to comic books I was firmly in the Marvel camp. More specifically, I was a Captain America fan. Because of this I am still puzzled as to how I grew up with a Janex Batman and Robin talking Alarm Clock next to my bed. Who bought it for me? When did they buy it? I have no exact recollection (what am I blocking? ), but for as long as I could remember, I would wake up to the sounds and colorful image of the Caped Crusader and the Boy Wonder (who is driving a tiny Robin-sized Batmobile). A thing of beauty right? I am not sure where my original clock went to? When I went home on my most recent trip, I dug through just about every nook and cranny of the house and it did not turn up. This was disappointing , but maybe it is for the best, since I think I left a battery in it at some point and things got pretty badly corroded. Did you have a talking Janex clock as a kid? They made other characters. You think I should pick up a new one? Welcome to Super Mario… Stock Car? I did! As soon as I saw the picture, I could smell it again. That thick plastic hit me in the head so many times from falling off of the shelf over my pillow. I was very upset with Batman for that. I remember I got it for my 6th birthday. I think I broke it when I was seven. I was clumsy. How dare you! Only way Batman could win would be a lucky shot. The only way anyone else could beat the Star Spangled Avenger. This Clock was one of several toys I had as a kid that from day one didn’t work. Remco’s R/C FAT WHEELS was another! Then there were toys that broke immediately like, Electronic Spider-man . Web went right into his damn arm never to be retrieved on its first outing. Damn you toy gods! Same company also made a Batman Electric Toothbrush. One is on eBay. I used to have a spiderman electric toothbrush & a batman battery tester when I was little. (I would frequently use the batman battery tester to test the batteries in the spiderman toothbrush.) I have no idea what company made either one though. 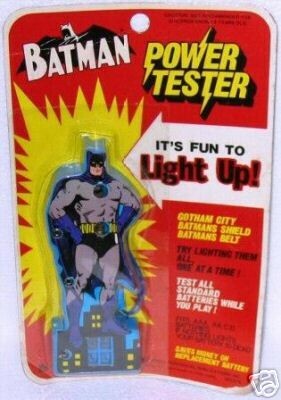 I had never know about the Batman Battery tester. What a great item to theme though, all the battery chargers and testers I see in the stores are so generic.